Canada’s Winnipeg Rapid Transit is the latest system to be added to BRTdata.org Photo by Craig Bennett. BRTdata.org, which features more than 90 geographic, statistical and service-level indicators, released a fourth update on Thursday, adding information on new lines from Canada to Colombia. 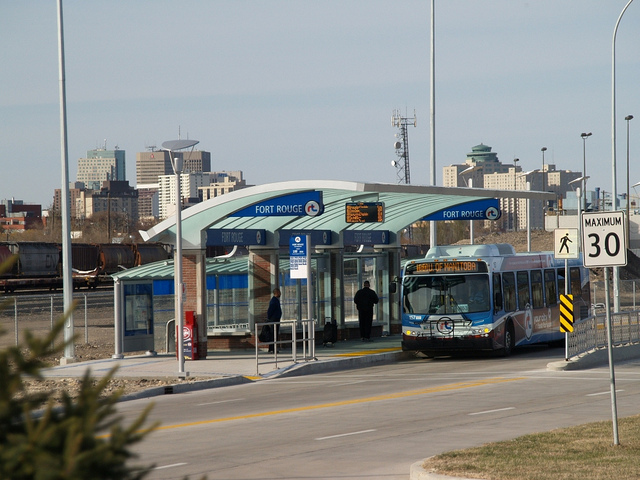 The website features the most comprehensive, public database of bus rapid transit (BRT) systems around the world, launched on April 2 by the Across Latitudes and Cultures – Bus Rapid Transit Centre of Excellence and EMBARQ (the producer of this blog), in collaboration with the International Energy Agency. This fifth update—Version 1.11—includes data now includes 143 cities’ BRT systems, representing more than 23 million daily riders. Some key updates added in this update include the Database’s newest city, Winnipeg, Canada in addition to corridor updates in several South American cities in Brazil and Colombia. “This database helps researchers, transportation agencies, municipal authorities and NGOs to understand and make decisions to improve systems and BRT bus lanes in their cities,” says Dario Hidalgo , director of research and practice for EMBARQ. BRTdata.org will continue to publish new or updated data on the second Thursday of each month.